For the majority of our members, the best unused space in their home is the basement. 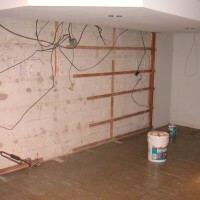 In most cases, renovating basement space is relatively easy, especially new construction. However, older basements can pose a challenge. The first step is preparation. It is best to start with a stripped down work area. Any old drywall and insulation, especially if moldy or water damaged, will need to be removed. Concrete or stone walls should be inspected for leaks and cracks. The condition of your walls will likely depend upon the age of the structure. In our area, the upper Midwest, there are a variety of basement types, from old turn of the century field stone or limestone and mortar walls, to 1950’s and 60’s era cinder block construction. These older wall types are more prone to leakage and bowing, so if that damage is present, a professional visit might be in order. Basement mold can be a common problem especially with older construction. Sweating copper pipes will leave a harmless green copper oxide stain on your floor. Moist areas can be the perfect breeding ground for mold. Black mold can pose health problems so it needs to be removed using appropriate PPE before any work is started. Read more about basement mold solutions in our Basement Mold Prevention article. If you’re shooting for a real “man cave” style bar, then older style walls could be patched and treated as-is to keep the true “cave man” look. Unless you’ve got full wall repair in the budget, patched is the most affordable approach. Always start by checking to see if you need construction permits. In my area (the country) we don’t have a lot of local ordinances or permit requirements. Within cities and towns, you may need to get a construction permit, especially for a full room renovation. 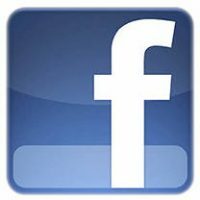 Here is a good link to use to check if you need a building permit. 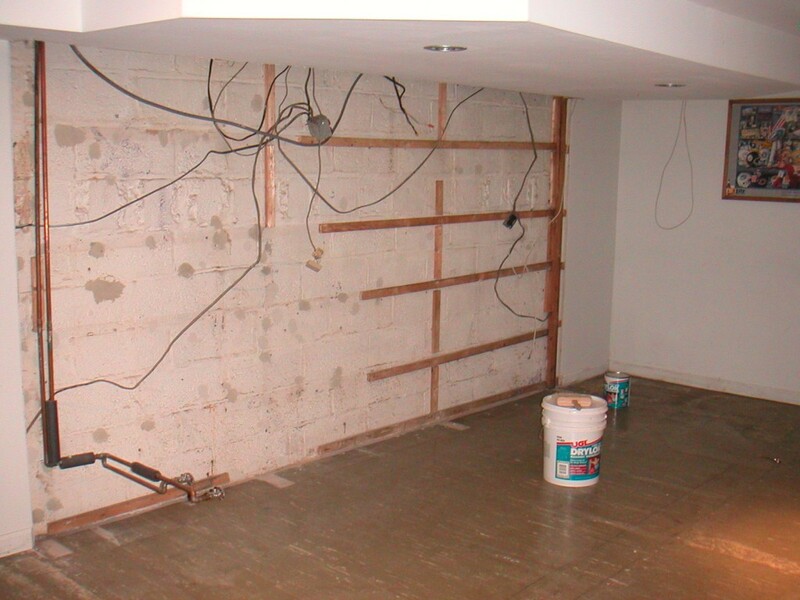 Basements built from the 1980’s on up usually use a poured concrete foundation and walls. This is by far the easiest basement type to renovate into a comfortable living space. Remove any sub par construction and start over if needed using a proper vapor barrier and studded walls. Sealing walls with Drylock or similar concrete paint is a great idea. Add electrical, sound and network wiring, then insulate and cover with drywall. Check your local codes and have all DIY work inspected as needed. 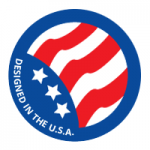 Depending upon your local ordinances, a building permit is usually required. Ceilings should be covered to hide trusses or floor joists. The best approach is a drop ceiling which is easy to install and allow full accessibility for future electrical, cable TV, sound or network. Future accessibility is an important consideration. We used pine tongue and groove on one of our first basement bar projects and it was regretted due to the inability to access the interstitial space between the basement ceiling and first floor. 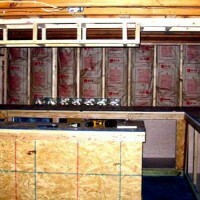 Once you have the room remodeled, you can go ahead with the bar construction. If you’re lucky enough to already have a nice clean, modern, well constructed basement space, then you can skip all the above and move right to building your bar. Start with the floor. You can usually build over existing flooring, but it’s always best to cut out carpeting around the bar. The back bar area should be all tile, laminate or solid wood flooring. The patron side can be carpeted, but I prefer a 3 foot perimeter using the same easy to clean flooring you use behind the bar. the “Dan Cave” before and after – awesome job! A carpeted runner can be placed behind the bar to soften the floor for your bartender. Rubber floor mats can do the same, but they can be a bit pricey. Remember, we’re all about building a bar on a budget. The photo at left is an amazing transformation of one site member’s basement renovation project. The “Dungeon” was transformed into the “Dan Cave“. Just goes to show what a little hard work, paint, lumber and a set of plans can do for your basement. The ceiling still needs work as it’s still open to show sewer drains and such, but it can be doctored with some paint to clean it up. Kinda gives you that under ground utility feeling. Watch your head! 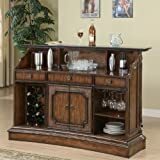 See another great example of a classic home bar. Finding Actual Plans, not Ad Candy. 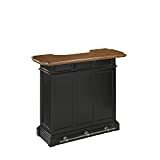 While searching for basement bar plans and designs, you’ll likely find a bunch of ad sites exclaiming “89 Home Bar Designs for Basements…” or “40 Inspirational Home Bar Designs…“. The resulting jungle of advertising is enough to drive you nuts and crash your browser… those sites display an endless series of photos (many stolen from other sites, including this one) and a one sentence blurb that seldom relates to the picture. No plans, and certainly NO DESIGNS. Most of the photos are of over the top bars that most of us could never afford. Most of the so-called “basement bars” they show aren’t even in a basement. 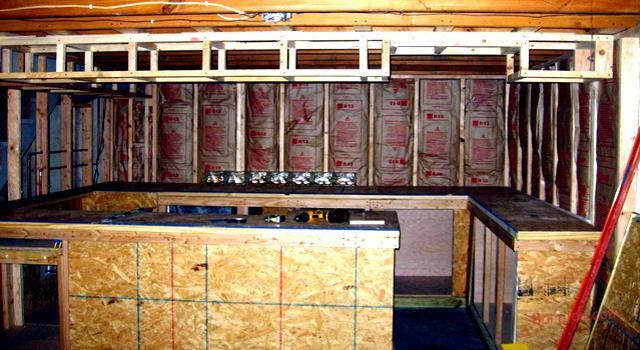 Basement bar designs need extra provisions to account for moisture and possible basement flooding and our designs to just that. Check out the current collection of home bar designs all available for instant download and ready to build. Thanks & Have Fun!